One week a month, Watch This offers television recommendations inspired by the week’s new releases or premieres. This week: In honor of the series finale of AMC’s Hell On Wheels, our favorite episodes about trains. The citizens of Springfield are not a sensible people. A small people embiggened by a noble spirit, sure, but not the type to be trusted with a $3 million settlement from the local nuclear power plant. C. Montgomery Burns’ toxic negligence might put a tentacle on every tree and a “Hide The Ooze” merit badge on every Boy Scout, but that’s nothing compared to the wonton destruction Lyle Lanley (Phil Hartman) wreaks upon Brockway, Ogdenville, North Haverbrook, and (to a lesser extent) Springfield. Now remembered as one of the show’s finest half hours, “Marge Vs. The Monorail” was one of the earliest examples of The Simpsons running roughshod over an otherwise grounded sense of reality. The vehicle chosen for that roughshod running is one of the episode’s keys to success, however: a monorail, the public transit system of tomorrow—today! The chosen people-mover of Disney parks (not to be confused with the PeopleMover) and other fanciful visions of a future that never came to pass (in the United States, at least) becomes the latest symbol of the things Springfield wants just because it doesn’t have them. And Springfield doesn’t even need a transit system of this magnitude: As Lisa Simpson points out during Lanley’s visit to her classroom, it’s a small town with a centralized population. Unfortunately, her typically iron-clad skepticism is no match for the con man’s smooth-talking, multidirectionally pandering ways. Lanley is another of the episode’s masterstrokes, the smarmiest huckster the late Phil Hartman ever brought to The Simpsons. Whereas Troy McClure and Lionel Hutz had the benefit of building their bad reputations over the course of multiple episodes, Lanley has but a few lines to telegraph his particular brand of fraudulence, aided in no small part by his folksy aphorisms and Hartman’s unctuous characterization. That, and the debts he owes to The Music Man, from his Harold Hill wardrobe to his literal song-and-dance number. Even for a Simpsons script with Conan O’Brien’s name on it, “Marge Vs. The Monorail” is a curious melange of pop-culture source material. (When O’Brien initially pitched the monorail concept to then-showrunners Al Jean and Mike Reiss, they cautioned that it might be too out-there for the show.) In addition to a decades-old musical, the episode draws upon the Flintstones theme song, Silence Of The Lambs, Tim Burton’s Batman movies, and the original Star Trek. Even the monorail itself is a cultural relic, as its inevitable breakdown reveals that the train was salvaged from the 1964-65 New York World’s Fair. But “Marge Vs. The Monorail” is first and foremost the story of a town, and no matter how zany it gets—and it gets plenty zany once Marge Simpson starts investigating Lanley’s previous marks—the people of that town keep the episode grounded. Not that that keeps their heads out of the clouds—but who could blame them after such a toe-tapping sales pitch? Availability: “Marge Vs. 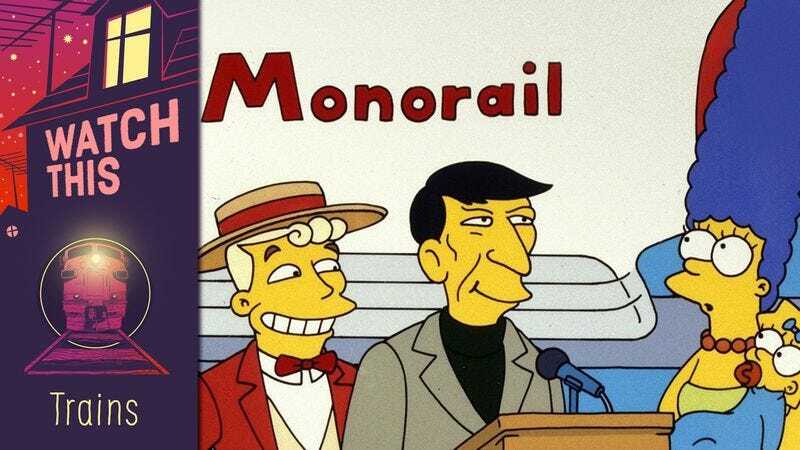 The Monorail” is available for streaming on Simpsons World and FX Now, for digital purchase, and on DVD.